Here, in the Exhibition on Line, we intend to show complete sets of fine prints: small thematic collections, albums of special interest, or related works, with some general remarks as to their creation and their importance. This space will be renewed regularly, with the previous exhibitions accessible thereafter in the Archives. These travels resulted in the landmark set of lithographs for his album Restes et Fragmen[t}s d'Architecture du Moyen Age, published in 1824, exploring the new medium with a refined graphic treatment. 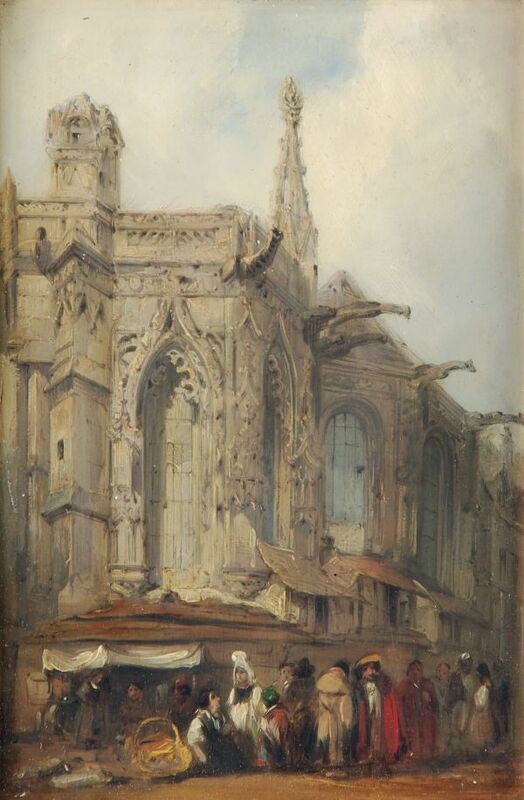 Though born British (near Nottingham, in 1802), Richard Parkes Bonington moved with his parents to France in 1817, first Calais, and then Paris, where he met Delacroix while studying in the Louvre, and with whom he developed a lasting friendship. In 1820, he was admitted to the École des Beaux-Arts, working under the Neoclassical painter, Baron Antoine-Jean Gros. Disaccord with his mentor led him to abandon Paris in 1821, and explore provincial life on his first trip to Normandy. He commited himself to the new style of painting après nature, a more spontaneous and unrestrained style, executed with an alert hand and a keen eye, prefiguring the Barbizon school and Corot. 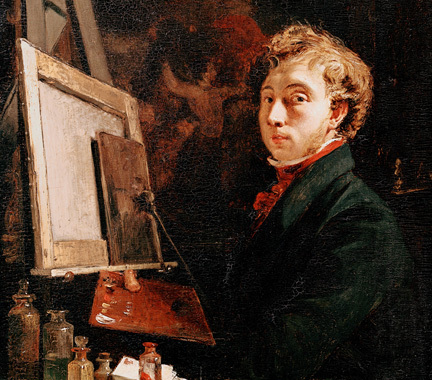 He was soon quite well known, not only in artistic circles, and even exhibited his first paintings at the Salon de Paris in 1822. Such a perspicacious eulogy is simply remarkable! Furthermore, Corot later recalled the revelation — upon seeing a Bonington watercolour in a shop window — that made him decide to become a painter. * "In my opinion, there may be found in other modern artists qualities of force or of exactitude in rendering greater than those in Bonington's pictures, but no one in this modern school, and perhaps none of his predecessors, possessed this lightness of execution, which, particularly in watercolour, makes his works into kinds of diamonds by which the eye is flattered and ravished, quite independently of whatever subject or imitation." Richard Parkes Bonington (1802-1828) was a major figure in the emergence of Romantic art and a source of inspiration for many of his contemporaries, as well as a considerable number of followers. - a clear predilection for small formats (such as may be seen on the easel in his self-portrait, right). We unfortunately have few examples of his preparatory works for these prints (see P. Noon, Richard Parkes Bonington, the Complete Paintings, New Haven, 2008), which makes these oil sketches all the more important. Furthermore, Romantic interest in the architecture of the Middle Ages was a clear break from Neoclassical canons, which held Graeco-Roman Antiquity in the highest regard, while dismissing medieval art as Gothic, i.e. the "barbarous German style" as defined by Vasari centuries before. Normandy is of course named for the Norsemen who raided and colonized the northwest coast of France. Properly speaking though, Normandy was first founded by Rollo, a Viking jarl, who had invaded in the lower Seine valley and even beleaguered Paris. In 911 AD, by treaty with Charles the Simple, king of Western Francia, Rollo pledged to him feudal allegiance, and converted to Christianity; in exchange, all the land between the Epte and the sea (i.e., the lower Seine basin) was ceded to Rollo. He established Rouen as his de facto capital. Normandy became a duchy per se in the late 10th century, and Caen became a second capital as the Normans expanded westward. Here, William the Conqueror built his immense castle around 1060, founding two abbeys shortly thereafter. Its churches were already remarkable in the early 11th century. The Palais de Justice of Rouen is a rare example of Gothic civil architecture still extant, and the Parlement de Normandy is one of the institutional foundations of Norman identity. The Duchy of Normandy, the capital of which was first established at Rouen in 912, made up the heartland of the Anglo-Norman realm until 1204, when it became part of the royal demesne under Philip II of France. Philip brought in French administrators, and built the château to affirm his power,but the judicial system was maintained under the authority of Norman law; the Norman Charter of 1315 stipulated that judgements passed in the Exchequer at Rouen were supreme and could not be overturned by Paris. The Exchequer of Normandy was thus the sovereign judicial court of assize, but which only convened occasionally; it was transformed into a permanent court of justice during the états généraux of Normandy in 1498, which in 1515 took the name of Parlement de Normandie. This period corresponded to the first phase of construction between 1499-1508. During the Revolution, Rouen lost its status as a seat of Parlement, the sovereign court was abolished, and the building itself was severely damaged. In Bonington's time, the Palais de Justice was transformed into a royal court of law (1814/1815 - 1848), yet the specificities of Norman law and its practice, embodied in the Parlement de Rouen, perdured into the 19th century. Dans un hôtel de ville, il faut en même temps de grands espaces et des bureaux, des salles de réunion vastes, des accès faciles et des pièces retirées ; de l’air, de la lumière partout. Au rez-de-chaussée, une salle des pas-perdus, large vestibule communiquant aux divers bureaux, aux salles de conseil, s’ouvrant sur un degré relativement ample et facile, conduisant au premier étage, à la grande salle, destinée aux fêtes, aux réunions publiques. The Eglise Saint Sauveur in Caen is a curious mix of Gothic and Renaissance styles, with a double nave. The belltower and the easternmost nave, devoted to Saint Eustace (Saint Eustache), were constructed in the 14th century. In the 15th century, the building was transformed into a hall church ("église-halle" like the German Gothic Hallenkirche), with an adjoining nave of similar proportions, that extends into a three-sided apse with large bay windows. A broad ogival arch, 16m across, was built to integrate the new apse. This new construction entailed serious transformations, and the Saint Eustace nave was rebuilt in the early 16th century, in a Renaissance style, resulting in an architectural appostition that apparently caught Bonington's eye. 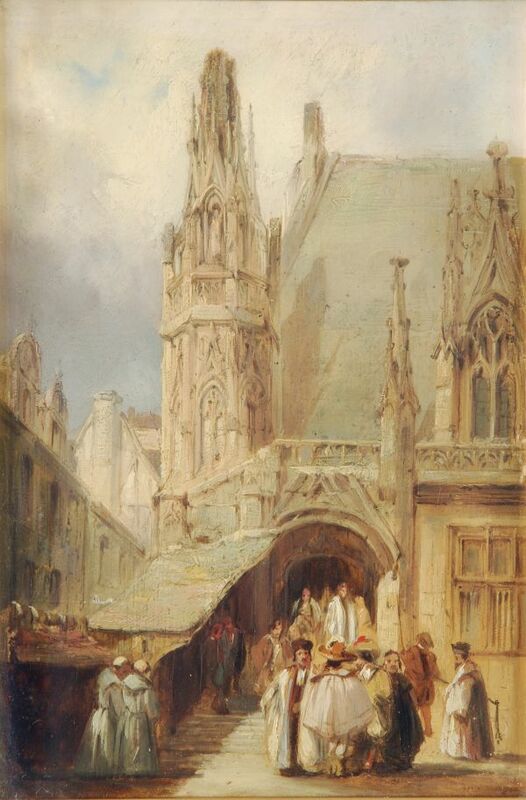 * See Albert Dubuisson & C. E. Hughes, Richard Parkes Bonington : his Life and Work, The Bodly Head, London, 1924, page 51; see also Marcia Pointon, The Bonington Circle: English Watercolour and Anglo-French Landscape, 1790-1855, The Hendon Press, 1985.